Yes, I have two new test knits ready to go on my Ravelry forum! I've already got the Whakemārie well under way so I'll be managing three test knits all together. July is going to be ridiculous filled with new designs. I had two goals in mind for this design: one, use one skein and two, work the decreases so that the lace pattern stays intact right until the last few rows. If you look at it from the crown down, the decreases converge to make a star shape! Nice and neat. I used one skein of Quince & Co's Chickadee yarn (181 yards) and it is absolutely lovely. If you are interested in this test knit, sign up here. Oh boy, this one. This is my first garment design (and second garment I've ever knit? Yes, I believe so!). This is a dolman sleeve, crop-top, open front cardigan with a lace and cable pattern on the back. It is very airy but when the front is left open (second image), the back doesn't leave for much shaping as it hangs away from the body, instead of clinging to it. Nonetheless, it is a very graceful and cute cardigan, great for throwing over your shoulders on the slightly chilly days. Accompany this piece with a clasp or your favorite shawl pin! 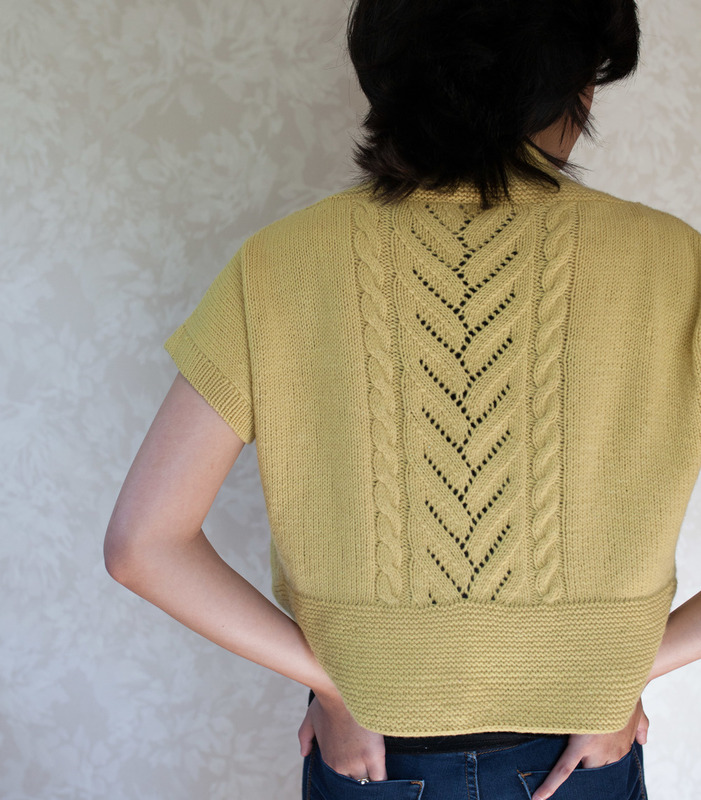 If you are interested in this test knit, sign up here. I've been really pushing myself in my designs as of late, trying new techniques that I've been wary of before. This week, I learnt how to knit fair-isle flat, which is a huge deal for me because I'm still rather uncomfortable knitting fair isle in the round! But now that I've been knitting swatches for design submissions that involve fair isle, I've become more confident in this technique. And now knowing that I can do this opens up so many design possibilities! Another technique I think I have mastered, or at least am more at ease with is the mattress stitch. The mattress stitch is used for seaming up garments, a technique that may knitters fear to use (I don't blame them, it is rather scary!). However, I found a small adjustment in the type of selvage stitch helps me a lot in keeping the stitches in line and stay in the same column. I was able to seam up the Whakemārie top in less than 30 minutes! Now what technique should I tackle next...? 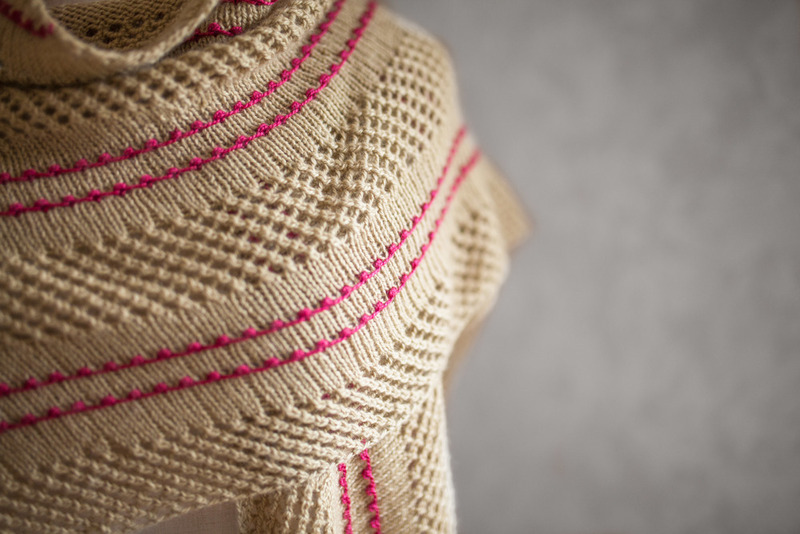 The Arius Shawl is slated for release this Friday (May 15th). As always, I will be giving away a copy of the pattern to a select few lucky people! If you haven't seen already, here are a few images from my project page. This shawl is knit bottom-up, using decreases and increases to shape the shawl into its asymmetrical shape. 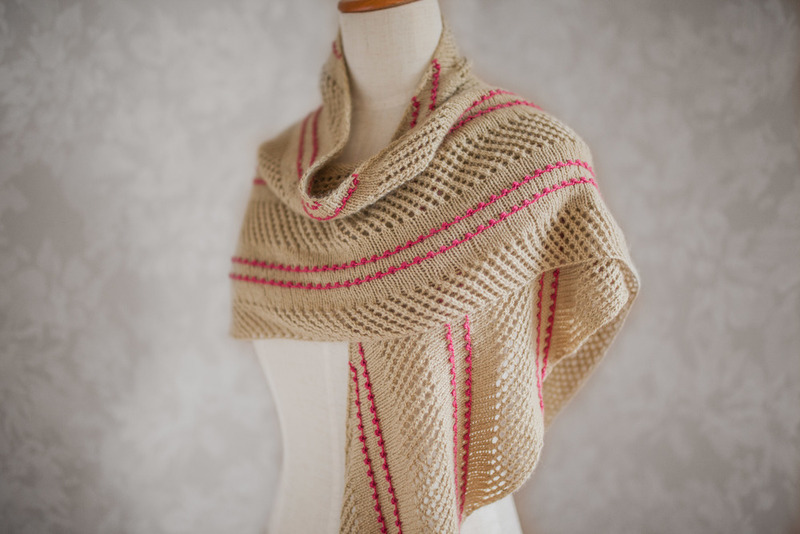 The shawl features an eyelet section paired up with a pop of color in the form of miniature bobbles on a stockinette background. There are two ways for you to enter this giveaway. I will be choosing four lucky knitters at random from my blog and IG account. 1#: Leave a comment on this blog post! When you do, please leave your Rav ID! 2#: Follow me, like the giveaway image and tag three friends on the giveaway post on my Instagram page. And that's it! Two easy and quick ways to get your name in twice for the drawing! Good luck! Winners will be announced upon release of the pattern this Friday! Knitting is an expensive hobby. Designing knitwear might be even more so, at least in my case. Why? Because at least one skein of yarn is going towards just the swatches, meaning I have to make sure to purchase one more skein of yarn on top of the set amount. I'm quite particular about my swatches, since different yarns will produce different results. 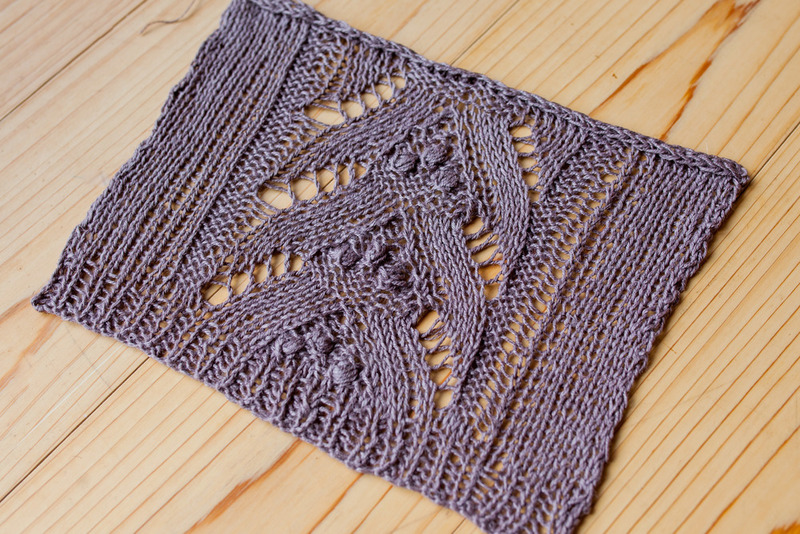 Once I swatched a lace/nupp design using wool-based fiber and it didn't work out at all. Then I swatched it on linen yarn and the results were remarkable. I still wasn't satisfied with the top two swatches. The bottom one doesn't count since it's pretty much needed. Sometimes, however, when I am working on a design and I already have all the yarn I need for the project, I have to make extra swatches, apart from the standard stockinette swatch. The pattern I had envisioned to use for the project doesn't work well with the yarn and I can't simply just use a different yarn because... I have already invested quite a bit of money into the skeins. So I have to make changes and adjustments and use up just a bit more yarn until I have swatched a design that is to my satisfaction. Designing knitwear has taught me to be patient and flexible. I believe that the more I work with different yarns, fibers and weights, I'll be able to know which ones are best suited for different types of projects, like lace, cable, colorwork, accessories, garments and even seasonal knits. Confession time: I actually enjoy swatching for garments (I never swatch for accessories unless it is to test a pattern), since the information I gain from them is rather invaluable - gauge, how it reacts to blocking, drapiness of the fabric, etc. It's just a part of the process of designing!